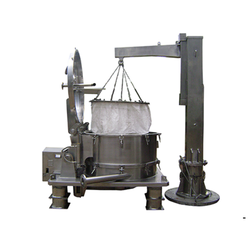 Bag Lifting Type Centrifuges are offered by us to our clients. Bag Lifting Type Centrifuges manufacturer and supply by us. - The time required for cake removal is negligible. - Cake spillage on the floor is nil. - Easy cleaning of the basket in and out. Bag Lifting Centrifuge is an improvement over the Manual Top Discharge centrifuge and is now a very popular model. In this model the Filter Bag is fastened to the Basket top plate. The Basket Top plate is in turn locked onto the basket shell. we Will Be provided on demand according to material selection and applications. Height mm. : 225 mm.to 350 mm.